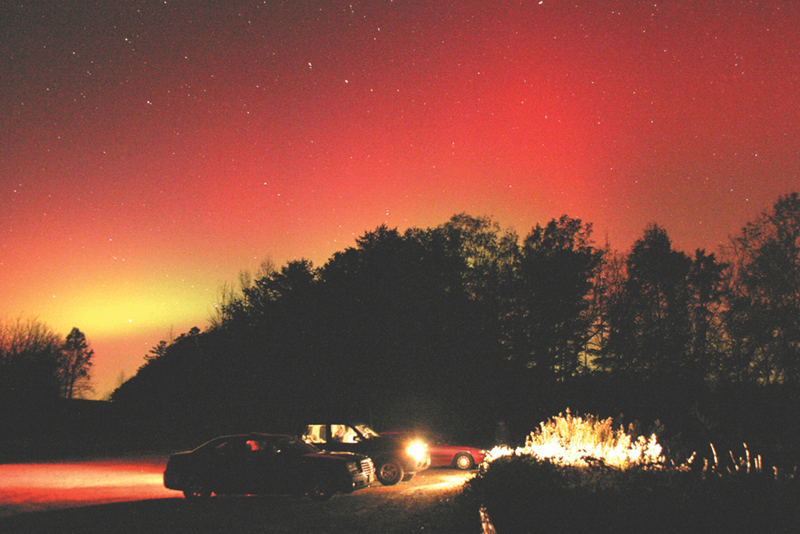 Are the mysterious lights people have seen around Brown Mountain a natural phenomenon? Extraterrestrial orbs? Shared hallucinations? An elaborate hoax? Regardless of their origin, the legend continues to grow with each successive generation – year after year, night after night. Paranormal investigator Joshua Warren is silhouetted by cloud-shrouded moonlight. The points of his trench coat collar are turned up, two daggers jutting toward Brown Mountain. Though he’s just returned from a three-month expedition to the tropics — where he was researching curiosities near the Bermuda Triangle — his skin is impossibly pale. In this light, with that jacket, the Asheville-based ghost hunter looks like a mythological vampire in the flesh. Of course, I’m not going to be the one to tell him this. Warren would probably get a kick out of the association. But we’ve got enough spookiness to deal with. After all, we’re at Burke County’s N.C. Highway 181 overlook to catch a glimpse of the Brown Mountain Lights — unexplained orbs reportedly seen here in every season, at all times of night. Like many North Carolinians, I can’t remember a time when I didn’t know about the lights. But I’d venture to guess I first heard about them in elementary school, during a history lesson. Because — if the cardinal is our state bird and the dogwood is our flower — the Brown Mountain Lights are our mystery. An introduction to the phenomenon usually comes with at least one associated legend: that they’re the lanterns of someone searching for a lost hunter, or those of a woman looking for fallen warriors. Nearly all the stories feature people on a quest for someone or something. This has inherent beauty, since the lights make seekers of us all. The first recorded sighting occurred around 1854, despite popular claims of Cherokee stories dating back hundreds of years. Additional reports came in the early 1900s. These stories captured the public’s attention and led to a fascination that lives on. For Warren, viewing the Brown Mountain Lights was the genesis of an entire career. Back before he hosted his own Travel Channel show, before he’d published even one of his 13 books, Warren was just a kid sitting in the backseat of his parents’ car headed up to this lookout, where he watched the Brown Mountain Lights dance up and down in the distance. They seemed like fairytales brought to life. “This is where I made the leap from sitting around and reading stories to getting out and searching,” he says. Warren has brought the sort of equipment he uses in paranormal investigations. “When the lights are about to appear, this usually goes off,” he says of a small electromagnetic monitor that he’s placed on a picnic table. He finds it helpful, if not reliable. Cell phone activity can make it hiss. “Sometimes, even the magnetic field of the body can set it off,” he says, waving his hand above the monitor, as if he’s holding a magician’s wand. The gauge moves, ever so slightly. Warren is open to alien connections and government conspiracies, as well as scientific-minded explanations. In 2012, he was a speaker at Burke County’s Brown Mountain Lights Symposium. Recently, the county hired him to write a pamphlet, Brown Mountain Lights: A Viewing Guide. In it, he gives general suggestions like: Visit in fall, after the leaves are gone. And we have yet to make sense of Brown Mountain. But not for lack of trying. In 1913, the U.S. Geological Survey made its first research trip. Their representative decided that the sightings were locomotive headlights. Three years later, a flood washed out train tracks, but the lights were still seen. Not long after, the U.S. Weather Bureau and Smithsonian Institution made inquiries, followed by the National Geographic Society. Institutional interest has since dwindled. But questions remain. This composite image of several photos shows some sort of light above Brown Mountain. Could it be an airplane? Lightning? Or, the Brown Mountain Lights? • Photo by Charles Braswell Jr.
Are the Brown Mountain Lights even real? That’s what The Brown Mountain Lights Research Team wants to know. The group, formed after the Burke County Symposium, is made up of roughly a dozen scientists and curious locals. Most of the time, they meet in private homes. Tonight, they’ve gathered in a Spruce Pine cottage. Ed Speer, retired geologist and resident skeptic, fires up a projector to share a PowerPoint presentation, starting with a list of possible light sources. Earthquake lights — which could be caused by thrust faults in the area — sun-related lights, fireworks, lightning. Could people be mistaking these things for something else? After all, people are spending more time inside, and it’s estimated that nearly two-thirds of the U.S. population no longer experiences true night due to light pollution. 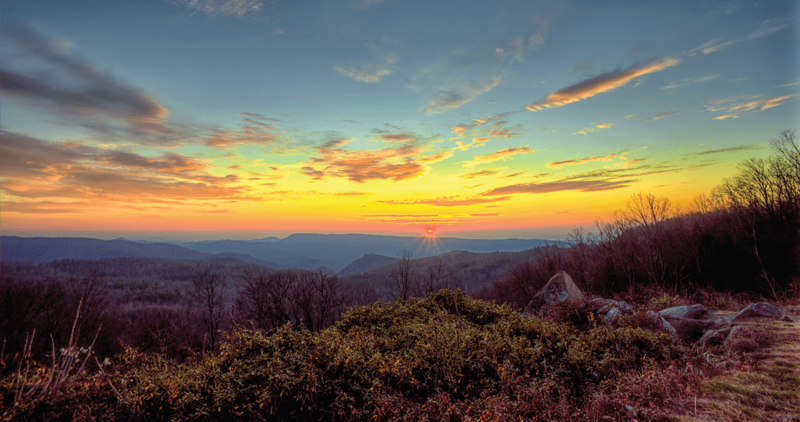 Ironically, forest-isolated Brown Mountain — known for its lights — is precious for its darkness. Not long ago, Speer found glowworms near Wiseman’s View. He says, “We knew they were there from when we were kids, but they hadn’t been documented.” Yet there they were, glowing. He’s also seen foxfire, light produced by fungi. Ultimately, though, he thinks most reported lights are campers’ flashlights moving up and down the mountain. The team has done experiments on headlamp visibility, with surprisingly long-range results. But it’s not a popular theory. The team, determined to solve the mystery of the 1 percent, is planning new experiments. Methane, or swamp gas, has not been proven to exist in the area. But recreational hikers have confirmed the presence of bogs. The group muses: Maybe, if they sloshed around, they could release methane and induce the wetland-borne phenomenon known as will-o’-the-wisp, or ghost lights? But, for Glover, the appearance was extraordinary for more than obvious reasons. Because meaning, like believing, is a deeply personal thing. Dan Caton and Lee Hawkins, two physicists from Appalachian State University, claim to be the world’s experts at not seeing the lights. They can’t count how many times they’ve been out in search of them since a student first approached Caton — a professor with multiple silver-stud earrings — to tell him about the phenomenon after an astronomy class in the late 1980s. They just know they’ve been skunked every trip since. When they finally reach a parking lot, Hawkins takes the lead with a flashlight. Caton trails behind, toeing the ground. Near the edge of the overlook, the path turns to rough stone leading down to two crow’s nests, or pulpits. They visit the upper pulpit first, where a craggy tree blocks the moon. A cricket is racketing a song carried on the damp, cool air. Hawkins points to his left. “That’s what we’re seeing on camera one right now.” Nightly, he has a camera on Jonas Ridge, shooting video of Brown Mountain. It’s streaming a live feed at this very minute. Anyone with a computer could log on to see it. He points out city lights in the distance. They are small, faint as fireflies. “You’ve got air currents bubbling around between here and there. That’s what makes them twinkle,” Hawkins says. The town of Hickory appears to glimmer, swirling air turning it into an earthbound constellation. Speer believes these lights are often mistaken for the unexplained. But it certainly doesn’t sound like what Glover experienced. And then there are stories of people — well-respected, local people — who have actually touched the lights, teeth chattering as if they’ve put their hand in a light socket. Close encounters like these are the ones that keep Hawkins and Caton going. Caton says there was a time when his feelings about the lights swung from pessimistic to cynical. He almost gave up on them altogether. But then he started hearing stories like Glover’s, stories that make it highly unlikely the lights were misidentified. What could people possibly be seeing? And, if they could see it, why couldn’t he? The facility, built in 2008, is a global hub of information. And it hovers on the edge of our state’s great mystery. The dark skies around Brown Mountain reward sky-gazers with stunning views of stars, planets, and even an occasional light show, courtesy of the aurora borealis. • Photo by Charles Braswell Jr.
Caton thinks, with the right funding and equipment, he could shoot an image feed of the Linville Gorge right into Google’s facilities, given its vicinity. But even if the camera were to record something of note on those servers, the information would lead to a cascade of ever-lengthening questions: Is this something not yet known to science? If it’s ball lightning — a rare, little-understood atmospheric phenomenon that Caton suspects — how did it form? Why is it so prevalent? There would be plenty to unravel, even without broaching the conspiracy theories of Joshua Warren’s fans or the larger questions raised by Debbie Glover’s experience. In a few hours, as the moon rises, whitecaps will be visible on the Linville River, more than one thousand feet below. Hawkins and Caton know this from experience. They’ve grown as familiar with this landscape as with any on earth. Because — despite rutted roads and late hours, and despite the lack of reliable predictions — they leave the comfort of their homes to search for the lights in person, with all their senses. The drive behind this impulse is, especially during frigid winter months, hard for Caton to ascertain. He crosses his arms and stares into the inky ocean of unknowns that stands between him and the twinkling lights of the Google compound. “I don’t know what compels me to keep coming out here,” he says, shaking his head. “I really don’t.” Still, he returns. Night after night. Year after year. He pushes his belly up against the hard stone of this pulpit. He gets as close to the mystery as he possibly can. Then, in darkness, he waits.